The Immigration Bureau will begin blacklisting foreigners who overstay their visas starting March 20. New rules approved Nov. 27 will prohibit overstayers from re-entering the kingdom for up to 10 years, depending on how long they resided illegally in Thailand. Penalties also vary depending on whether the overstaying foreigner voluntarily turns himself in or is arrested. For those who surrender, foreigners overstaying up to one year will be banned for a year from coming back to Thailand. Three-year bans await overstayers of 1-3 years while those who have lived here without a visa for 3-5years will be banned for five years. Overstayers of more than five years will be banned for 10 years. 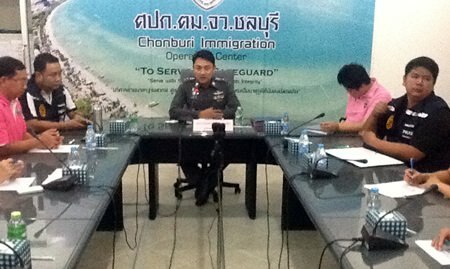 Chonburi Immigration Office Chief, Pol. Lt. Gen. Natorn Prohsuntorn announces the new rules prohibiting overstayers from re-entering the kingdom for up to 10 years, depending on how long they resided illegally in Thailand. “There is a refugee crisis in the Middle East as well as some African countries. Some (refugees) manage to make it to Thailand and make the country their home after arriving on a tourist visa,” said Chonburi Immigration Office Chief, Pol. Lt. Gen. Natorn Prohsuntorn. Natorn cited examples of marriage scams, in which vulnerable women are conned out of money to pay “fines” for a man they met over the Internet when he arrives in Thailand, or drug smugglers transporting narcotics through Thailand.